The Servicio de Educación Cristiana– SEC (Christian Training Network – CTN) was formed in 1960 by Melvin Hodges, Regional Director for LAC. At that strategic moment in history, each LAC country had at least one Bible school and those missionaries involved wisely saw the need for a ministry to coordinate and unify ministerial training efforts. Luisa (Jeter) Walker was the first coordinator of SEC (1960-1968), followed by Vern Warner (1968-1979), Monroe Grams (1979-1994), Roy Smeya (1994-2007) and Jim Mazurek (2007-2009). I have had the privilege of serving as coordinator since 2009. SEC makes LAC unique as a region. No other region has the numbers or unified program that LAC has. 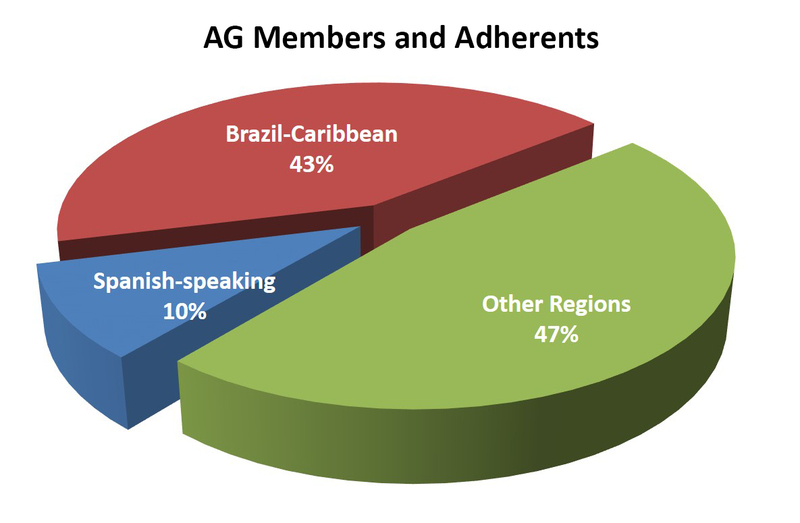 The Spanish-speaking countries of LAC represent about 10% of Assemblies of God (A/G) adherents worldwide. These same countries have almost 50% of A/G Bible schools (including extensions, annexes and ministerial study centers) of the A/G worldwide. In addition, these countries have about 35% of all ministerial students worldwide (presence and distance) and nearly 50% of all workers studying in a classroom setting. These disproportionate numbers speak to the importance and emphasis given to ministerial training and likely to the historical success of our training program. The Nature of SEC. SEC has a leadership team called the Administrative Committee. AGWM missionaries lead and serve alongside national leaders advising national Bible school and local church programs, directing two international schools (ISUM – fourth year of Bible school, Facultad – Masters) and serving in a variety of specialized international ministries. SEC’s Directory Board is comprised of the Administrative Committee and all of the National Superintendents and National Christian Education Directors of member countries. Coordinating such an entity has its challenges! Member countries are autonomous and often think independently. Even the members of the Administrative Committee function largely independently, both nationals and missionaries alike. The complexity of the national-missionary relationship and the inherent qualities of leadership and independence that mark AGWM missionaries make meaningful evaluation and significant change very difficult. However, as an older organization, strategic planning is necessary to keep us from falling into – or rescuing us out of – institutionalization. Strategic planning. Back in 2010 our staff at the Centro de Recursos y Asesoría (Resource & Advisory Center that helps our Bible schools) conducted a FODA (SWOT in English) to identify the strengths, weaknesses, opportunities and threats of our ministry. This study helped us to make some important adjustments. I carried this experience and the results forward and began to think about the need for strategic planning for SEC. Sensing that transparent evaluation is the first step in strategic planning, we launched theVisión 2020campaign in 2013. We asked the members of the Administrative Committee to answer important questions about the ministry that they were leading. The results did not qualify as transparent and effective evaluation. We had to look for a different approach to accomplish our objectives. We did report these results to the Directory Board at its meeting in 2015 and concluded our time with a brief interaction with the board to identify be our most important values. What Is Really Important Us? Values define the core of an organization’s DNA. Traditions and practices are important, but values are more important. This truth hit home during a segment of the 2017 Educational Leaders Dialogue. With the broad representation gathered, we decided to conduct a FODA analysis of our program for transparent evaluation. What an amazing experience to hear our leaders describe our strengths and weaknesses, identify opportunities and threats. We then began to list our values. Many of the strengths mentioned also made it to the values list. I realized we had finally arrived at the basis of strategic planning by understanding who we are and what matters to us. SEC’s Five Essential Values. There certainly are more. Nevertheless, through months of conversation and processing, the following five are those that made the final list. Personal spiritual formation. The Christian life is evidenced in daily life and spiritual disciplines like prayer, fasting, Bible study, faithful attendance and service to the local church, giving tithes and offerings and the development of the fruit of the Holy Spirit. These habits should begin at conversion and happen in the local church. Even so, they must remain strong in each stage of ministerial training. As such, it is also a constant, progressive training that lasts the whole life. Pentecostal. The first duty of the believer and worker is to learn to listen to the voice of the Holy Spirit, be committed to obey it unconditionally and develop a life of absolute dependence upon Him. We believe that training that is Pentecostal recognizes the important and distinctive experience of the baptism in the Holy Spirit and in the believer’s universal call to service. The Holy Spirit gives gifts and power to believers for ministry and service. Premiere. Good results require quality programs with teachers and leaders that have a strong commitment to excellence. Each National Church must give priority to effective training of its workers, committing necessary resources and gifted leaders to the task. The church and training institutions must maintain high standards in their program, encouraging each worker to “work hard so you can present yourself to God and receive his approval. Be a good worker, one who does not need to be ashamed and who correctly explains the word of truth.” (2 Tim. 2:15, NLT). Baptism in the Holy Spirit. Many believe it was the outpouring of the Holy Spirit that was the true catalyst of the turn of the century missions movement. Our fellowship believed that the baptism in the Holy Spirit was the indispensable requirement for missions service. This belief transferred to any ministry. The baptism in the Holy Spirit was taught, expected and experienced. Communion with the Holy Spirit and dependence upon Him. The baptism in the Holy Spirit is just the start of heightened sensitivity to His presence in our lives. A Pentecostal understanding of the priesthood of all believers recognizes that each believer has the privilege and responsibility to abide in Christ through ongoing communion with the Holy Spirit and to learn to listen to His voice, unconditionally obey Him and depend upon Him in every aspect of life and ministry. Essential role of the Holy Spirit in the life and ministry of the believer.The Holy Spirit sows His fruit in the life of the believer. He endues spiritual gifts to empower ministry. He gently whispers into the heart. He directs our steps and gives wisdom liberally. Knowledge and commitment to sound Pentecostal doctrine. Pioneer LAC missionaries understood the important of imparting Pentecostal doctrine. The first Bible institute study plan was based upon the Manual of Conduct (reglamento interno) and Brief Courses (cursos breves), developed to teach Christian living and basic Christian doctrine for believers in the local church. Sound Pentecostal doctrine continues to be a priority today. Divine call to service for every believer. Our pioneers also taught that ever believer has the privilege and responsibility to serve God in ministry. In part, it was for their survival because of the rapid growth of the church. There are very few spectators in our churches in Spanish-speaking LAC. We believe in ministry and we credential more workers than others (LAC has 10% of A/G adherents worldwide, but 17% of credentialed workers). There has been an explosion of lay workers in our Bible schools in recent years. The Spirit is activating His church in ministry! Local church. The local church network is the most important component of an effective accessibility strategy. Workers are born in the local church! As such, the local church is a believer’s first “School of Ministry.” Lifelong training begins in the church as discipleship. The success of the Bible school is maintaining a strong, “serving” relationship with the local churches in its region. In LAC, congested metropolitan areas open study “classrooms” (aulasor anexos) in churches around town with its pastor teaching the group. Geographic. LAC continues to decentralize and diversify. The explosion of extension schools has resulted in shrinking central schools. Even so, these schools have reconnected with the churches in their city and have diversified their program to better serve the churches. Today, there are more than ten times the number of schools, extensions and training centers and four times the number of students than in 1985! Academic, social and ethnic. Geographic accessibility has opened new training opportunities in remote areas, some considered unreached, especially among indigenous groups. The training program must be adapted to meet these special needs. Traditional academic and social guidelines require modification to meet the higher purpose of training workers for the harvest. Levels and modes of study. In 2009, SEC added the “Bible Certificate” level (64 credits) to its program, largely directed toward the laity. In addition, that year SEC added specializations(mini minors) of 14-18 credits in Pastoral Ministry, Youth Ministry and Missions. In 2012, SEC added two more, Christian Education, Children’s Ministry and Church Planting. In 2015, University Ministry was added. SEC, countries and individual schools continue to innovate to address new competition and complexities. Bible schools and teachers will add new programs and learn new tools to maintain relevancy in the face of ongoing change. Shared Ownership. The Assemblies of God established SEC in 1960 with the purpose of strengthening ministerial training; the curriculum program specifically designed for this purpose. Recently, we have learned to appreciate the value of ownership. Ownership is unique since 20 countries have a share! Directory Board and its autonomy. Even though AGWM (DFM) established SEC and missionaries have served in leadership, the structure of SEC has evolved. 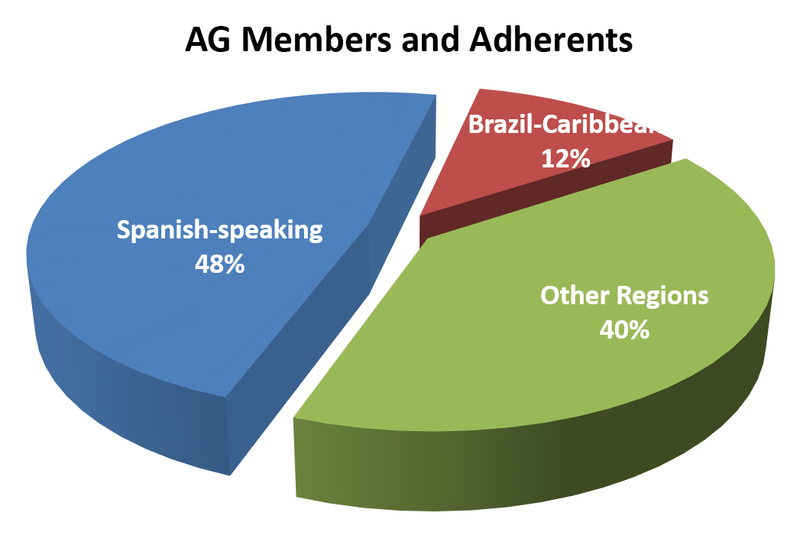 Today, nearly three-quarters of the members of the directory board are Latin-American, leaders representing all member nations. The Plan Básico(Basic Plan) outlines the complete program and the board must approve any changes. Independence of study program. Therefore, the board sets both program and policy. While aware of possible governmental interventions, SEC remains independent and is not subject to interference or regulation. SEC decides what an “approved worker” needs and the SEC structure allows for an agile response to new tendencies and demands. SEC has made significant changes to the Bible school level and its two schools in the last ten years, evidence of healthy agility. Contextualized and flexible program. SEC contextualizes its curriculum to the needs of the LAC region. In addition, SEC provides flexibility to optimize the program in each country. Both content and delivery systems demonstrate the two important qualities of the SEC brand: Knowledge and Fervor. Experienced ministry practitioners and leaders teach SEC classes, inspiring future ministers and leaders. Bibliographical materials. During the first several years, while the Assemblies of God still owned Editorial Vida, Missionaries working with SEC published several textbooks, some still in use today. The Faith and Action Series provides a growing number of textbooks for the diploma level. These books are property of SEC, available electronically and easily printable in individual countries. Some of our Latin-American leaders and theologians have written works in use in Bible school and ISUM. Ownership of bibliographical materials gives us full control over availability and edition of these works. Role of training program in credentialing workers. The most telling evidence of shared ownership are the training requirements that member countries have to qualify for different levels of ministerial credentials. We conducted an informal survey to find out during the 2017 Educational Leaders Dialogue of the 14 countries represented. As suspected, most of member countries have very similar requirements. We conducted a formal survey last year with all countries reporting. We confirmed the results of the informal survey, of the LAC Spanish-speaking countries, 18 of 19 (except Belize) require Bible school graduation with a minimum of 96 credits for ordination. Seven require additional credits with ISUM. Two require completing ISUM (or comparable program). In the Latin America/ Caribbean region, workers that desire credentials with the Assemblies of God attend Assemblies of God Bible schools. This strong institutional connection between credentialing and training reflects ownership and commitment. Cooperative Unity. The LAC region is unique in having so many countries that share the same language and very similar cultural history. God has used this uniqueness to form SEC, a federation of otherwise independent countries to become a strong training alliance, marked by cooperation and unity. Educational family. As coordinator, I have consistently referred to our Christian education program – local church, Bible school, ISUM, Facultad, etc. – as our educational family. We share the same values and demonstrate a solid commitment to each other, like any family. In all of the international gatherings that I have attended –Cumbres(Summits), Dialogues, ISUM seminars or Facultad modules – the sense of family is strong. I wrote an article in Spanish, published in Conozcathe end of 2017 entitled How Beautiful is Our Educational Family(http://conozca.org/?p=3304). I share four qualities of our family relationship: respect, goodwill, commitment and unity. Of these four qualities, unity is the natural result when the others are at work. Unity declares, “We are better together than apart. Together, with Christ, we can conquer any problem.” Unity is the best foundation on which to build SEC. Service association. SEC is an association of service. Instead of a legislative body that demands compliance, SEC earns participation by providing mutually beneficial services. As a federation, all member countries, fully autonomous, willingly set aside their independence to join the educational family, believing that they will receive benefit and that they will also benefit others. Standards with flexibility. We have already considered that standards established by ATAL and approved by the board. SEC publishes these standards and program guidelines in the Plan Básico. The Plan promotes unity, but does not require uniformity. Certification. More than one thousand teachers have become members of ATAL. SEC continues to encourage Bible schools to join ATAL, work through the processes of auto-evaluation and make necessary changes to become certified. The Plan Básicopromotes unity; ATAL’s certification of teachers and institutions facilitates it. The journey continues. The Lord has blessed the Assemblies of God in the Latin America / Caribbean region. From the very beginning of the work in LAC, the Holy Spirit directed our missionary pioneers to establish and maintain ministerial training programs as an essential part of our strategy to evangelize, train and deploy. In 1995, missionary mentors invited Sherry and me to join them in their journey, which became part of SEC’s journey in 2003. In 2009, SEC asked me to serve as Coordinator. It has been a great honor and enriching learning experience. The best part has been this recent journey to discover the essence of who we are as an organization. For me, it has been a journey of values. This is an excellent historical account of LAC educational evolution over the years! What a history with theology and praxeology working together to give ministerial leadership in the LA region outstanding clout to impact the nations! The leaders mentioned demonstrate what it means to be led by the Holy Spirit and to exemplify the indigenous church principles, including self-theologizing. Our forefathers would rejoice! Thank you so much, Rod, for this explanation of AG Christian Education in Latin America. I wonder since I work with ChildHope, if ChildHope schools in Paraguay couldn’t also be included in that day to day process of “formacion integral”? We are working to win our students to the Lord and then prepare them to be ministers of the Word wherever the Lord leads them whether it be as a full time or part time Christian worker. In any case, thanks for this informative and inspiring article, Rod. Thanks Rod for the reminder of God’s faithfulness and leading of the Holy Spirit. When early LAC missionaries undertook a new project the need outweighed the obstacles and so they plodded on. I remember reading of how Melvin Hodges and Ralph Williams rode donkeys in El Salvador to establish churches and Bible schools. They probably had no idea of how far reaching their efforts would be. Reminds me of Zechariah 4:10, “Despise not these small beginnings, for the Lord rejoices to see the work begin…” (NLT). May we missionaries be faithful today to carry through with what the Holy Spirit inspires us to begin!